"I also invite the fans to back us in numbers tomorrow, because if we want to win, then the support from Manjappada and every single fan out there is very important, " said Nelo Vingada’s in his first ever press conference as head coach of the Kerala Blasters. Clearly, he knew there was more than what meets the eye to the Sisyphean task offered to him at one of the most prestigious clubs in the Hero Indian Super League (ISL). In an ideal situation, Vingada would have wanted to take the reins at the Jawahar Lal Nehru Stadium during a time in which the supporters were at their vociferous best, unfurling banners to the sound of the beating drums and filling their stadium well above the 'official' seating capacity. However, as a repercussion of their flimsy start to the fifth edition of the ISL, the veteran coach was welcomed to God's own country with a record lowest attendance figure at this venue of merely 4582 during his first game in charge against ATK on Friday. To put things into perspective, that figure is mathematically just under 15 per cent of the highest attendance figure at the Jawahar Lal Nehru Stadium in Kochi. The manager or his players did not complain though, they knew the magnitude of the task in hand as soon as they stepped out to play. It was all about returning to winning ways, not just with respect to the game, but also in terms of the confidence and the supporters. Despite playing in front of a largely empty stadium, the Kerala Blasters did not flatter to deceive under the tutelage of Vingada against perennial rivals ATK. A reaction from the players was expected and they wasted no time in starting quickly off the blocks. Ultimately, the hosts ended up creating the better chances and playing the better football, but most importantly, it amounted to nothing both on and off the pitch as they walked away with just a point without turning enough heads as the 'supporters' opted to stay away, yet again. Desperate times might have called for desperate measures in the past, but the decision to stay away from games even after the arrival of Vingada, which offers a breath of fresh air, is quite baffling, to be honest. What good is being a supporter if you don't turn up in numbers and help your team win games of football, especially after you have seen the end of what you wished for? Most players feed off the atmosphere generated by the fans and the absence of it could only result in lackadaisical approaches and obscure performances. 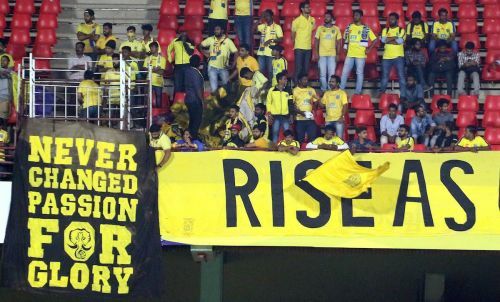 It is crystal clear that the problems at Kerala Blasters have now seeped right through the cracks and the longer it dampens the surface, the more the damage to the foundation of the club. If the 'Men in Yellow' were crucified for underperforming on the pitch during the first half of the season, then the argument pointing towards the loyalty of the 'supporters' stands valid at this moment in time. Football is a game of fine margins and it is hardly ever a bed of roses for everyone involved, but the sheer unpredictability and passion that it engulfs makes it one of the simple pleasures in life all around the world. Maybe the fans in Kerala should try to have fun, rather than pointing fingers at their own players. Maybe they should believe for when that elusive win comes, they will be flying sky-high with their heads gleaming in confidence. Maybe, they should just learn from the past and move on like Vingada opined, in the hope of a better tomorrow simply because, as long as there is life, there is always hope. And hope is a good thing, maybe the best of things, and no good thing ever dies!